Fred Nance, one of the region’s most powerful and influential citizens, eased his tan Escalade to a stop. He pointed at the trio of black boys pedaling furiously through an intersection near the Cleveland-Shaker Heights border. Nance grinned and waved at the passing parade. They looked like city kids, not yet teenagers, racing home after a suburban adventure. He didn’t know them, but he recognized them. His eyes followed as the boys disappeared into the streetscape, taking with them any chance to learn their past or witness their future. “I used to ride my bicycle from East 135th Street and Kinsman, where we lived, to Shaker Heights,” he said. “I knew there was a different world than the one I saw every day in my neighborhood. I caught a glimpse of it, through the trees and across the lawns as I pedaled along South Park Boulevard, just like them. Let the record show: Fred Nance has arrived. Regional managing partner at Cleveland-based Squire Sanders & Dempsey, one of the globe’s whitest-shoed law firms, Nance, 55, is a confidante to mayors and the go-to guy for nearly every civic project that’s come Cleveland’s way during the past two decades. He is one of this region’s most recognized and influential citizens. That’s the public side. In private, Nance is one half of a civic-minded couple. His wife, the former Jacqueline Jones, heads the LeBron James Family Foundation, an Akron-based group that helps children and families in Northeast Ohio. Both husband and wife are high-profile attorneys. Fred’s working-class childhood shaped his life. Jakki, as everyone calls her, grew up in comparative affluence. As a married couple, they complement each other. She’s the playful, outgoing and social counterpart to his more serious, studied and practical personality. Both are committed to improving the region. Nance was set on his path during the long, violent summer of 1966. In a social experiment that preceded Cleveland’s failed school-desegregation efforts, Jesuit priests recruited 12-year-old Nance to attend St. Ignatius High School on the near West Side. This was years before busing became the long-running court case that Nance would argue against on behalf of the Cleveland School District in federal courts. No, at this moment, Nance found himself waiting at the intersection of East 55th Street and Woodland Avenue for a bus to take him across the Cuyahoga River and the city’s racial borders of east and west, black and white. For six days during that summer, rioters burned and looted in the Hough neighborhood after racially charged clashes between a white business owner and black customers. Young Fred watched in awe as National Guardsmen with fixed bayonets rode past in military halftracks on their way to engage the rioters. Right then, Nance made a promise to himself. He entered St. Ignatius that fall at the bottom of his academic class. Four years later, he graduated with an A average and rejected full scholarships to Princeton and Yale for one to Harvard. After graduating from Harvard and the University of Michigan Law School, Nance returned to Cleveland in 1978, joining Squire Sanders & Dempsey as one of the few black associates at the firm. In 1987, he became a partner. 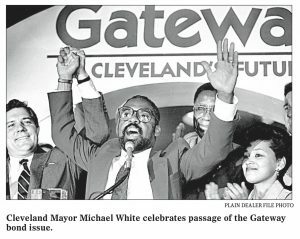 His life and career took a dramatic turn in 1991 when Cleveland Mayor Michael R. White needed a lawyer to represent him in a grand jury investigation. White wanted Charlie Clarke, then the dean of Squire Sanders trial attorneys. White settled on Nance only after Clarke canceled appointments with the mayor and sent the young and promising black lawyer in his place. As Nance recalled, Clarke’s motive was to give him an opportunity that would promote his career. It worked to perfection. Two years after that rocky start, White called Nance to ask him to negotiate a lease for him. The lease turned out to be the contract between the city and Art Modell, who wanted to move the Cleveland Browns to Baltimore. When the legal wrangling ended, the team had moved, but the city kept the Browns’ names and colors and the promise of a new team in 1999. That legal work thrust Nance into the big time, and he bloomed as the go-to lawyer in Cleveland. In the early 1990s, he was working on the busing case when he met Jakki. His first marriage had ended after 10 years. Jakki, too, was divorced and working for another law firm. Their courtship is the stuff of family lore. Thrust together on the legal project, the two lawyers huddled over one-on-one lunches. Following each meeting, she billed him for her time. She was completely unaware that Nance scheduled the get-togethers to get to know her better. Determination born of adversityJakki had a more privileged childhood than Nance, but a more stressful and dangerous one as well. Her father is Dr. Jefferson Jones, a nationally recognized oral surgeon, who wanted nothing but the best for his two adopted children: Jeff and Jakki. The family lived in affluent white communities where they weren’t always welcome. Jakki Nance, 42, remembers racial attacks and social ostracism that dogged her and her family as they integrated predominantly white neighborhoods and schools. Vandals struck their home repeatedly when they moved into Pepper Pike. Someone broke the tops off three driveway light poles. The house was egged. Eventually, the night marauders fired shots into the house. Jakki said it scared her, but not her father, who armed himself and refused to leave. Her father wanted her to become a doctor, but she pursued dance before deciding to become a lawyer. Her years at Orange High School were filled with confrontations with white teachers who doubted her intelligence and black and white classmates who shunned her. Only after leaving Ohio in 1984 to attend Spelman College, the predominantly black women’s school in Atlanta, did she find a sense of self and acceptance. Jones, now retired, said his daughter’s childhood experiences made her determined to succeed. “She had the attitude that nothing would stop her from what she wanted, that she would show everybody what she was made of,” he said. She returned to Cleveland after college and entered law school at Case Western Reserve University. By the early 1980s, she was working in a family friend’s law office and seeking ways to make a mark in the city. She and Nance were married by White in 1999. Jakki Nance has been instrumental in turning around the disorganized LeBron James Family Foundation. Under her direction, the foundation has formed closer ties with local businesses and created profitable projects like an annual bike ride for charity. The couple agree that their lives far exceed anything they ever imagined as youngsters. When the National Football League needed a new commissioner a year ago, Nance’s name was on the short list. John Wooten, chairman of the Fritz Pollard Alliance, a Washington, D.C.-based group that advocates for greater diversity in professional football, said the organization recommended Nance for the job because of his role in bringing a new team to Cleveland after Art Modell moved the Browns to Baltimore. “Fred Nance was a guy who’s a great lawyer and we felt helped us save Cleveland and save the Browns for Cleveland,” said Wooten, who played on the Browns’ 1964 championship team. While the couple toyed with the idea and enjoyed the attention, neither Fred nor Jakki was eager to leave their comfortable lives in Cleveland. Currently, Nance is neck deep in negotiations to secure a Medical Mart/convention center as the curative to an ailing downtown. Why is Nance the go-to guy on so many civic projects? Tom Stanton, chairman of Squire Sanders & Dempsey, thinks it’s something simple, elemental and rare. “People trust him,” he said. • 1979 — Carnival kickbacks — As a first-year associate, Nance joined the trial team that successfully represented George Forbes against accusations that the then-Cleveland city council president had accepted payoffs from a local carnival operator. • 1991 — Doan and Beehive school projects — A county grand jury investigated whether then-Mayor Michael White had, as a councilman eight years earlier, used his position as a city councilman to aid the development of real estate projects in which he was an investor. White wanted the top trial lawyer in the city to represent him. Instead, the law firm sent Nance. The grand jury never charged White, and the two men became friends. For Nance, it was the start of a relationship and an entree to a series of lucrative legal contracts with the city. • 1995 — Cleveland Browns — Nance represented the city in a lease dispute with Browns owner Art Modell, who was in the process of moving the team to Baltimore. The Browns were forced to delay their move and to leave all team colors, names and trademarks in Cleveland. • 1997 — Concourse D — Nance negotiated a 30-year lease of the new concourse with Continental Airlines, a $100 million investment that ensures Cleveland Hopkins International Airport remains a Continental hub. • 2001– Brook Park land swap — Though many other attorneys were involved in the decade-long litigation over the controversial decision to swap land and municipal boundaries between Cleveland and Brook Park, Nance claims credit for settling the matter. The deal allowed construction of an extended runway at Hopkins. • 2003 — The throwback jerseys — Nance had no clue who LeBron James was, but agreed to help the high school basketball player at the request of a friend. James faced suspension from the state championships because he accepted two vintage basketball jerseys worth about $845 from a clothing store. Nance won in court, allowing James to lead his team to the state title in his senior year. Nance’s wife now heads James’ foundation. • 2005-2006 — DFAS — Nance led the successful effort to retain 1,100 jobs at the Defense Finance Accounting Services Center in Cleveland. • 2007-present — Medical Mart — Nance spearheads the ongoing talks to develop a new convention center and medical mart in downtown Cleveland. Comfort zone without boundariesThis is no small feat and, in large measure, is the real secret to Nance’s success. In a hyper-segregated, class-stratified city, where East rarely meets West and wary tribes mingle at arm’s length, Nance is expert at crossing boundaries. Or, to put it another way, Nance never lost the feeling of freedom, just like the carefree boys on bicycles, that comes with racing across the sharp and bright lines dividing one part of Cleveland from another. To that end, he added, it’s important that he and other black professionals hold themselves up as examples. Nance makes crossing boundaries appear effortless and perfectly natural. To watch him work a room — whether at an all-black social gathering, a racially mixed civic meeting or formal presentation where he’s the only African-American — is like watching a skilled athlete going through practiced repetitions. “My forte is dealing with difficult people in stressful circumstances to come out with a positive result,” he said. None of this is easy. Years of preparation and practice — along with setbacks and miscues — precede the performances that make fans cheer and detractors jeer. And he does have detractors. Though few of them are willing to say so out loud or in public. Nance has heard such talk. After recounting these critical comments, Nance laughed and said there might be a bit of truth to them. Nance recently joined a dozen professional black men on a stage at Audubon School, a public elementary school not far from his old neighborhood. One by one, the men — doctors, engineers, college professors and lawyers — described their occupations to the kids, who sat in wide-eyed wonder at the idea of people who look like them doing unimaginable things. When his turn arrived, Nance spoke without a microphone, projecting his deep voice to the back of the auditorium. Nance paused for dramatic effect, as the kids perked up at the name of the famous basketball star. The auditorium exploded in cheers as the kids stood to applaud. And Nance, beaming just as he had when the boys on the bicycles crossed his path, crossed yet another boundary, pressing his own childhood dreams onto the next generation. The mayor wakes at 5 a.m., without an alarm clock, on the day he will announce the end of his reign in Cleveland.Instantly alert, he turns to wake his wife JoAnn. They have planned the day, practically down to the minute, and Mike White wants them to start it together. He’s surprised at how calm he feels. Neither nervous nor emotional, just prepared. Battling a bit of a cold, he showers, dresses and has a cup of coffee. Today’s the day, he thinks. Let’s do this. At 5:30 a.m.. White calls his press secretary, Brian Rothenberg, telling him to be at White’s East Boulevard home at 7 a.m. Other key staff members are told to arrive at the same time. None of them know what to expect. Whenever Rothenberg has pressed White about running again, the mayor has flashed his wide smile, but said nothing. By necessity, the mayor’s family knows more. So that they could make plans to attend the announcement. White and his wife began calling relatives two days earlier. Other than family, only three people know of White’s decision: his “guardian angel,” Sam Miller of Forest City Enterprises; his “other sister,” Carole Hoover, former president of the Greater Cleveland Growth Association; and his chief of staff, Judith Zimomra. Nobody else expects the day that will follow. After 12 years as mayor, five as a state senator and eight as a Cleveland city councilman, White plans to announce that he will never again seek elected office. The man who began his career campaigning for Carl Stokes as the age of 13 — passing out literature and cleaning bathrooms in campaign headquarters — has spent three terms in the same office Stokes occupied as Cleveland’s first black mayor. Despite his power and self-professed love of the job, White claims he’s ready to leave. Brilliant. Tyrannical. Compassionate. Vindictive. Nurturing. Aloof. Each of these adjectives has been used to describe White. In reality, he is a cocktail of them all-— a blend of both good and bad that is reflected in his emerging legacy. He’s considered by many to be the energy that fueled Cleveland’s decade of progress. More recently, he’s helped pass a levy to repair the city’s public schools and has battled to jump-start the expansion of Cleveland Hopkins International Airport. But he’s also been accused of failing to deliver to the city a new convention center, bungling plans for the lakefront and frustrating business and community leaders with a leadership style that leaves no room for second opinions. The telephone rings just as Cleveland schools CEO Barbara Byrd-Bennett steps out of the shower. It’s the mayor, saying he needs to speak with her. Byrd-Bennett looks out the upstairs window and sees the mayor on her front steps, holding her newspaper. Her hair uncombed and wearing no makeup, the CEO of Cleveland schools comes downstairs to let him in. He’s wearing a double-breasted suit and white shirt. She has on a robe and slippers. Byrd-Bennett looks out the window into the sunny morning, then turns to the mayor. The two sit for a moment longer before White stands up. She gives him a hug and he leaves the house. White’s children do not attend Cleveland Public Schools, which, though improving since White took control of the school board in 1998, still rank 545th out of the 549 school districts in Ohio (Dayton is the only big city that fared worse), according to 1999-2000 performance standards released by the Ohio Department of Education. The hope is to gain momentum, especially with the infusion of $380 million from the bond issue that s passed May 8 and with the continued leadership of Byrd-Bennett. But nothing is a given. Byrd-Bennett’s contract expires in 2002, with an option to extend it to 2004. Whether she renews in 2002 will be depend, to some extent, on who the next mayor of Cleveland is. “It’s such a partnership ” she explains, “such a strong relationship that you have to have.” There is much at stake. According to the agreement that gave Cleveland’s mayor power to appoint the school board, voters will have an opportunity in 2002 to either axe the arrangement or approve it indefinitely. Byrd-Bennett, who strongly supports appointed, not elected, school boards, says White’s successor will play a big part in the 2002 vote. “Whoever is the next mayor will have to clearly make some decisions about whether they support this system of governance,” she says. White’s faith in Byrd-Bennett has always been absolute. Later that day, he tells a room packed full of people at his announcement: “If this is not Barbara Byrd-Bennett’s last job, something is wrong with us.” From the driveway of Byrd-Bennett’s house, White calls his two youngest children from an earlier marriage at home — 8-year-old Joshua and 11-year-old Brieanna. His fourth wife, JoAnn, has two children from a previous marriage — 22-year-old Katy and 24-year-old Christopher — whom White considers his own. The older children were told about the announcement the night before, but White decided to wait till the morning to tell the little ones. Back home shortly after 7 a.m., White joins his staff and continues to execute his plan. With a list of 45 names and phone numbers in front of him — all people he wants to tell himself before his 10 a.m. announcement — he starts dialing. Using his home phone and two cell phones, he works the lines with help from his staff, ending one conversation and immediately beginning the next. He calls former staffers who have remained on good terms, the few council members he still counts as allies, old friends and the loyal few who helped him win in •89. After graduating from The Ohio State University, White got a job working as a housing aid for then-Columbus mayor Tom Moody. He used the experience as a learning tool, not a steppingstone to a better job in a city that wasn’t his own. “Some people are willing to succeed anywhere,” says Jerry Gafford, then chief of staff for Moody. “Mike wanted his achievements to be in Cleveland. 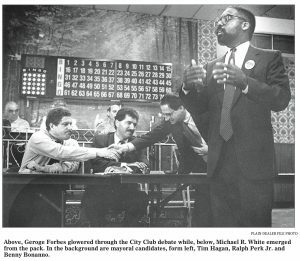 The mayoral campaign started out promisingly — White’s East Boulevard home was packed full of supporters during strategy sessions — but when then-mayor George Voinovich announced he would not run for re-election, a slate of strong contenders joined the race, including Forbes. “All of a sudden, Mike’s support disappeared,” remembers state Sen. Eric Fingerhut, White’s campaign manager at the time. “It went from people being jammed in his basement to four or five of us.” By the time he made his official announcement, his supporters were so few that one of White’s staffers recruited her father and some of her friends to create the illusion of an audience. It’s almost 10 a.m. and a room full of people wait in the auditorium of Miles Standish. White’s father and wife are in the first row and the audience is packed with directors, cabinet members and staffers. A few Cleveland powerhouses — Greater Cleveland Growth Association CEO Dennis Eckart, Byrd-Bennett and former Rep. Louis Stokes — dot the audience, but elected officials are scarce; councilman Zachary Reed suspects he is the only office-holding politician in attendance. Outside the school, Plain Dealer politics reporter Mark Naymik tries to enter, but the door is locked. He bangs on the door; no one answers. Finally, he makes his way inside through an unlocked classroom, taking a place among members of White’s administration sitting in the seventh row. But White’s scorn for the PD infects even this occasion. Naymik is outside the building when White takes the podium, following an introduction by Louis Stokes. White tells the audience he is “a child of Cleveland” and thanks a long list of people for their support over the years. White is scheduled to be at a Convention & Visitors Bureau lunch honoring him for his tourism efforts. Instead, he spends his lunch hour and early afternoon in the library behind the auditorium at Miles Standish, meeting first with family, then staff members. A half-hour later, somewhere downtown, a separate meeting begins. (Dennis Eckart, CEO of the Greater Cleveland Growth Association, explains later that the group included a “very interesting collection of business and community leaders,” but he won’t say who and declines to say where.) The group had planned to discuss an economic-development initiative, but the agenda changed — without a single word or phone call exchanged — as soon as White made his announcement. For the past several months, Cleveland’s unofficial pundits — a loose alliance of business and community leaders — have been lamenting the breakdown of the public-private partnership in Cleveland. Chances are good that some of them are the same people in this room. The same people who were desperately searching for another candidate when it was assumed White would run again. The same people White says he doesn’t much care to have as allies. In fact, Eckart says he hasn’t seen White do anything to jeopardize the spirit of cooperation that led to Cleveland’s comeback. “I have no objective evidence at all of that in my personal relationship with the mayor,” he states. But that doesn’t mean Eckart hasn’t heard the complaints. “I have talked to any number of other business folks who, 11 seconds into the conversation, would say, •Let me tell you about 1993,’ and recount some story about the mayor.” He even arranged to meet with one man, who had publicly complained about the mayor, to see if he could understand his perspective. “I said, •When the mayor turned you down, what did you do?’ ” Eckart remembers. “What was there for me to do?” the man shot back. He will not, however, divulge any names of those he feels have betrayed him. “I wouldn’t answer that question if you put a gun in my mouth,” he says. At 4 p.m., editors from The Plain Dealer meet to discuss what will fill the front page of the next day’s paper — an easy task today, though the specifics must be hammered out. “The field of candidates grows, I’m not kidding, by the minute,” city editor Jean Dubail tells the group. In the hours following White’s announcement, a half-dozen potential candidates express interest in taking his place, including former Cuyahoga County child welfare director William Denihan; county commissioner Jane Campbell; councilmen Joe Cimperman, Bill Patmon and Mike O’Malley; and Rep. Stephanie Tubbs Jones, who will ultimately decide in early July not to run. In order to show “maximum strength,” county commissioner Tim McCormack goes a step further. Just hours after the announcement, he stops by the board of elections to file petitions, followed by a visit to Plain Dealer editor Douglas Clifton. “McCormack clawed his way into Doug’s office to get a heads-up,” Dubail reports. The joke provokes a few laughs, but White’s battle with the PD is a serious one, pitting First Amendment rights against allegations of libelous coverage. The paper has sued White over delayed — or nonexistent — access to public records. White claims the paper has intentionally tried to defame him. The epic feud was played out in a single act earlier today: Incited by what he saw as a calculated attempt to annihilate his influence, the mayor of Cleveland banned a reporter from the city’s only daily paper from attending an announcement — held in a public building will change the course of the city. Though White’s office reportedly asked for extra copies of the May 24 newspaper. White will not say whether he was pleased or displeased with the article that ran. “They covered me,” he says stoically. Clifton explains that the reference stems from his days covering one time presidential hopeful Gary Hart. For the record, he adds, “There were no bushes,” and he has no nickname for the mayor. White says he never had a problem with any other newspaper, but cannot provide an explanation as to why he’s having such a hard time with The Plain Dealer. “This is a special case,” White says slowly, relishing the word “special” in a way that definitely suggests there’s some element of this combat he enjoys. White sits in his office, turning his attention to the more mundane duties of the day. It’s past 5 p.m., but there are papers to sign, phone calls to return and legislative agreements to hammer out — seven months of work left to do. The rest of City Hall is quiet. A few people stand talking just inside the main entrance, but the halls are largely deserted. Councilman Zachary Reed is the exception, moving silently through the building as he walks to his car to retrieve a briefcase. Reed was one of only four council members out of 21 whom White thanked during his speech earlier in the day. Council used to be much cozier with the mayor when Jay Westbrook was its leader, but a 1999 coup catapulted Mike Polensek to the position of council president. With the change in leadership, White’s control began to crumble, as did his relationship with Polensek. Elected to council in the same year, 1977, Polensek and White once enjoyed the camaraderie that sprang from that connection. In fact, when White first ran for mayor in 1989, not only did Polensek work the polls, he also recruited his mother to help. Two decades of politics devoured that friendship. In his retirement speech, White specifically thanked a total of 26 people — plus God — and acknowledged nearly a dozen others. Polensek was not mentioned. All of which makes the council president wonder if he made a mistake by campaigning for White so many years ago. “There have been times I asked myself, •Did I do the right thing?’ ” Polensek says. He notes that the relationship has become “more cordial” since White announced he’ll be stepping down. “We’ve talked more in personal terms about our families,” Polensek says. “I have a little bit more insight into his perspective, which we had not talked about in the past. But that doesn’t mean one can shed their armor completely before the battle is over. After talking about how he wishes White well and how “we are all God’s creatures,” Polensek sounds a subtle warning. In his life after politics, White, who turns 50 this month, may be a consultant, a gentleman farmer, a professor or an author. He may raise llamas, help children or do nothing. He may live in Glenville or in Newcomers-town, where he and JoAnn have built a second home. He may travel to places his wife has recently visited, such as Israel and Thailand, or he may stay in Ohio. All of the above have been speculated, but they are nothing more than guesses. The mayor’s not saying. “There’s a period behind that,” he says, referring to his previous answer. How does he think he’ll adapt to a slower pace? Will he still make Cleveland his primary residence? He will say not one word about his future. His voice rolls with passion, however, when talking about his past, especially about how he never sold the city or its residents out and how he feels he can leave office with a clear conscience. “It’s not about just running till you die,” he explains. “The only thing I wanted to do was serve as mayor, and I’ve done that. And I’ve tried to do it as best I know how. I’ve tried to be as honest as I know how and I’ve always told the truth about it. Even when people didn’t want to hear the truth. On the night of May 23, White returns to his world at about 8 p.m. to spend a night like any other. On the way there, he passes his old elementary school; his father lives just a half mile away. By 11 p.m., the day has worn on him; his voice is hoarse and his objective accomplished. The mayor closes his eyes and quickly falls asleep, ending his last day as a man with a political future. Or so he says. Whether there’s a period behind that remains to be seen. 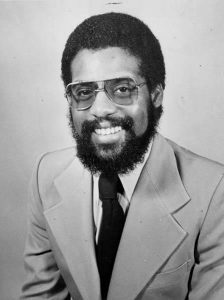 Michael R. White was Mayor of Cleveland from 1990-2002. He was interviewed for Teaching Cleveland Digital on July 24, 2013. Cameras by Jerry Mann and Meagan Lawton, Edited by Jerry Mann, Interviewed by Michael Baron.